Rev. Prof. Vanlalnghaka Ralte, Principal, ATC-in kaihruaiin tawngtainain bul a tan a, Seminar hmangtute lawmna thu a sawi. ATC Male Voice leh JRTS Trio ten thiam taka hla sain hun an hmang a, Thuchah tawi ropui tak mai, “Justice, and only Justice you shall pursue (Deut 16:18-20)” tih hmangin Rev.Dr.Zaihmingthanga’n a sawi bawk. Rev.Dr.K.Lalrinkima, Administrative Secretary (i/c Theological Education), PCI General Assembly-in thupui sawihawnna a nei bawk a ni. 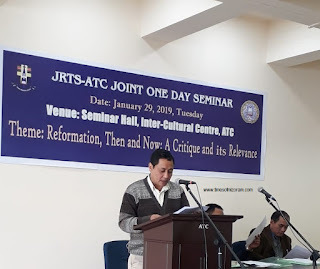 Chawhma lamah paper pahnih – “The Doctrines of Reformation and Their Relevance Today: A Reference to the Context of the Presbyterian Church of Meghalaya” Rev. Dr H.Rymbai (Associate Professor, Department of Religion, JRTS) ziak leh “Semper Reformanda: Ecclesia- Structural Reformation in the Context of PCI” Prof. Lalnghakthuami (Professor of Christian Theology and Dean of Doctoral Studies, Aizawl Theological College) ziak te zirho a ni a. Sawihona hun tha tak an hmang bawk.